We want to empower students to do the right thing, and to create a safer environment for learning. This involves more than just taking anonymous tips. Kids today are faced with a lot of dangers, dating violence, internet predators, bullying, drugs, underage drinking and more. We strive to give students access to people, resources, and services that can make them safe from all kinds of threats. 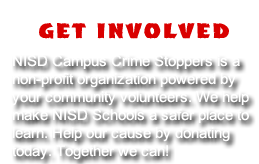 NISD Campus Crime Stoppers was established in the fall of 2009. 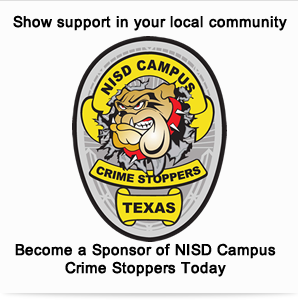 NISD Campus Crime Stoppers is a State Certified, 501(c)(3)non-profit corporation. One of our goals is to provide students with the opportunity and resources to give information by phone, text message or website tip about any illegal activities at their campus, thus providing a safer learning environment. 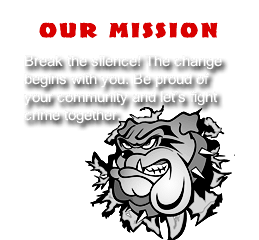 Our Program gives cash rewards for tips that prevent a crime or tips that lead to the arrest, expulsion or discipline of a student committing an offense against school district policy.